arriving in Namibia, but it’s the first time it’s likely – I’m pants-peeingly terrified. Less than 15m away, 4 cheetahs have stopped hunting to eye us off. I glance at my naturalist guide, Jonas – he’s the only one of us with any kind of protection. Well, he has a stick. Both he and our tracker Nicholas are standing as still and tall as possible; I follow their lead while fighting the urge to try to outrun the world’s fastest land animal. Then, just as I’m about to whimper, the coalition turns and slink back into the bush. For the next 20 minutes, we follow them discreetly while they continue their (unsuccessful) hunt for an antelope breakfast, and my nerves disappear as the minutes pass. I’m amazed by just how little they care about the curious humans hot on their heels. Exhilarating. It’s just one of many wild adventures available to guests at the Okonjima lodge, a 2.5-hour drive north of Namibia’s capital city, Windhoek (get your bearings here). Okonjima is comprised of several camps that operate independently – a main camp, luxurious bush camp and a few satellite villas for the super-mega rich). I stayed at the main camp, the most basic of the options, and was very comfortable in my little cottage room. The best part about Okonjima: it’s a safari lodge with a conservation twist. This 22,000ha private nature reserve is also home to the The AfriCat Foundation, which rehabilitates hyenas, leopards, cheetahs, caracals and wild dogs, which means you can see them doing their thing in their natural environment alongside other Okonjima locals like giraffes, baboons, antelopes, and even giant porcupines. You can also track hyenas on foot here. I gave it a go on my first afternoon at Okonjima and, even though I twitched too much to be able to take a decent photo, it was an incredible experience. Did you know that hyenas have the strongest jaws in the animal kingdom? I did – that’s why I was twitchy when I got so close to a hyena with nothing but two or three metres of grass (and his indifference) between us. 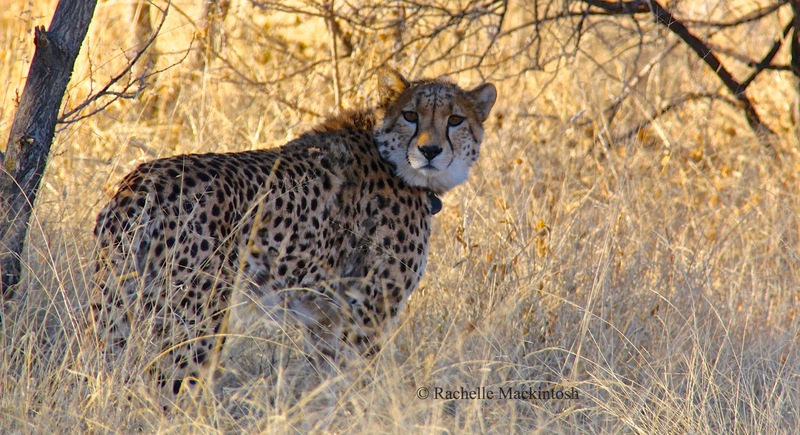 Other Okonjima adventures include checking out AfriCat’s research facility and field hospital, and doing Jeep safaris to radio track leopards and cheetahs. Actually, AfriCat is pretty amazing. The foundation was established in 1991 and was initially a welfare organisation that removed large carnivores that had wandered onto livestock farmers’ properties. If the animals were been injured, AfriCat would nurse them back to health before re-releasing them; if they couldn’t be returned to the wild, AfriCat gave them somewhere to live at Okonjima. Now, on top of animal rehabilitation, the foundation has a range of programs designed to educate locals on the human-wildlife conflict and to help conserve these precious carnivores for future generations. We like that.